The RSPCA has been given an official warning by the charity watchdog for reportedly awarding a former chief executive a six-figure pay-off.The Charity Commission began an inquiry after the Times reported that acting head Michael Ward was paid a sum more than his The animal welfare organisation declined to comment on the settlement. 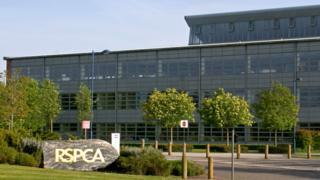 The Charity Commission criticised RSPCA trustees for not ensuring the decision was made properly, "particularly given the large sum of money involved".Trustees had "failed to act with reasonable care and skill" when negotiating the sum, the watchdog said.An official warning, which did not name Mr Ward or include details of his pay-off, said the failings amounted to "mismanagement in the administration of the charity".The Charity Commission's deputy chief executive, David Holdsworth, said the RSPCA was a "much-loved national institution performing a crucial role in animal protection" and said the public "rightly expect that it should be run by its trustees to the highest standards". "Unfortunately, that has not been the case and the charity's governance has fallen short, which has led to people asking legitimate questions about the pay-out to the former executive," he said. "Issuing an official warning signals to the trustees that we expect them to resolve this important issue and take immediate steps to improve the charity's governance." Mr Holdsworth said the use of formal legal powers was a "significant step" and said the commission would take further regulatory action if the trustees did not act on the official warning.He said the RSPCA's appointment of a new chief executive, the election of a new council and the introduction of a new code of conduct provided an opportunity for a "fresh start" for the charity.In a statement, the charity said: "The RSPCA ruling council is fully committed to the very highest standards of governance. "Council continues to implement the recommendations of the governance review, with more than 90% of them completed, and is working hard with our new chief executive on the outstanding items. "It said the charity's council was "united in its commitment to ensuring the RSPCA is a modern, outward looking organisation".Mr Ward was appointed as interim chief executive in June 2017, following the departure of Jeremy Cooper - who left after just over a year into the role.Chris Sherwood succeeded Mr Ward as chief executive in August 2018. He was previously chief executive of relationship charity Relate.The RSPCA went two years without a permanent chief executive after Gavin Grant left for health reasons in 2014.